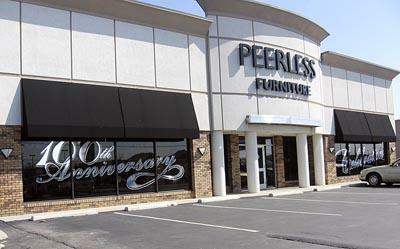 Peerless Furniture has been the premier St Louis Furniture Store selling high quality leather furniture to the Fairview Heights and St Louis community since 1907. The company has been family owned and operated since it first opened its doors over one hundred years ago. If quality is what you are looking for in your next set of furniture, look no further. Peerless Furniture has been the leader of quality and professional furniture sales as a St Louis Furniture store for more than a century. We try to make your St Louis furniture store shopping experience as painless as possible. To do so, we offer complimentary professional interior design with your qualifying purchase. There is no better way to make sure your new St Louis Furniture Store purchase will fit in with your current decor. Looking to change things up? No problem. Our professional interior design help will guide you in creating the perfect living environment to match your new quality furniture pieces. We appreciate your business so much, we are happy to provide this top class service with no additional charge. One of the most daunting things about the process of upgrading your furniture can be when it comes to transporting your new furniture to your home. For this reason, our St Louis Furniture Store has also been providing professional delivery and set-up for decades to its customers. Our delivery service spans up to an 80 mile radius from our store location in Farview Heights, IL. The service we offer includes both the prepping and set up of your new furniture items at a very low charge. It is important to note: our delivery service does not include the removal of your old furniture. Lastly, we stand behind our quality products. This St Louis Furniture Store's delivery service offers an in-home service warranty for up to one year after the date of purchase. We also offer the same service warranty for customers who pick up their furniture - however they will need to bring their furniture items back into the store in order to receive their warranty service.